Rome was the exact opposite of Ireland. Where Ireland was cool, clean and refreshing, Rome was hot, dirty, and humid. 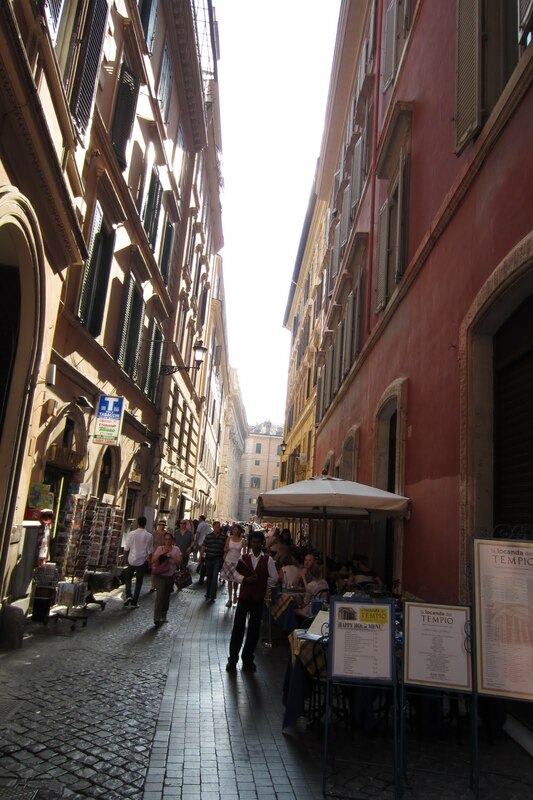 But even though we wilted the moment we left an air conditioned environment, Rome was beautiful. Crowded and expensive, but beautiful. Our time in Rome was split - a full day and a half at the beginning of the trip, and another almost full day at the end of it. St. Peter's Basilica is one of the most gorgeous spots in Rome. You can go into the basilica without touring the Vatican, but of course, there's a line to get in. We started our first full day there split up - M and Shorty had never been, and wanted to see the Vatican, but BF and I had both been there already. A Vatican tour is essential to a trip to Rome if you've never been - they have a great museum, and the Sistine Chapel and St. Peter's Basilica are not to be missed. 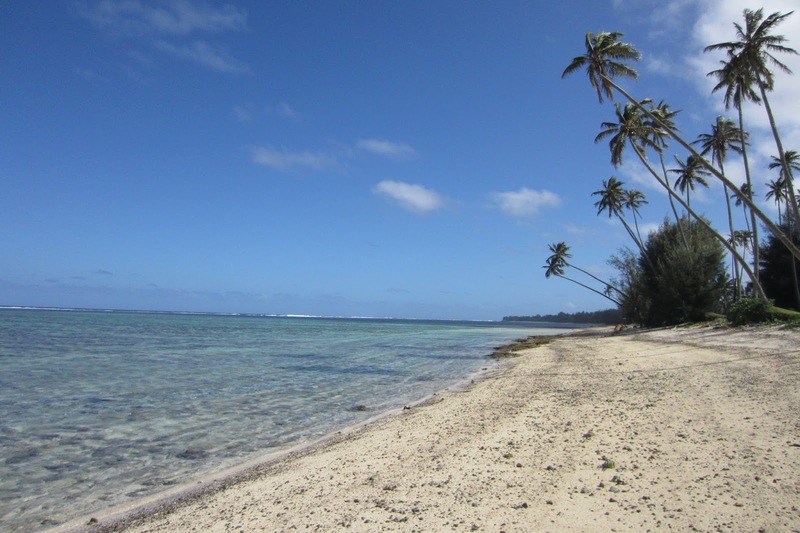 TRAVEL TIP: Make sure your clocks are set to local time! Dublin is an hour behind Rome, and we forgot this little fact. Shorty and M actually missed their initial Vatican tour because they woke up at the wrong time, but fortunately for them, the tour group was awesome and let them join the next tour. 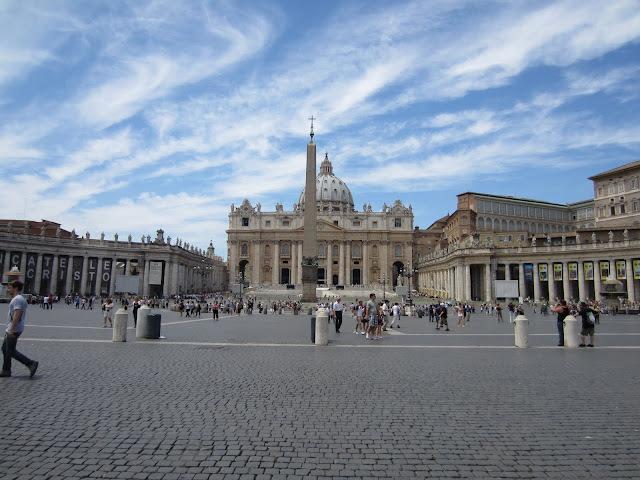 TRAVEL TIP: Skip the Vatican lines (which are longest in the morning) by booking a tour. I found the one for the girls through Presto Tours - they were great. The girls said the tour guide they had was really knowledgeable and friendly! Instead of touring the Vatican again, BF and I slept in a little, then wandered over to St. Peter's square to meet up with the girls after their tour finished. 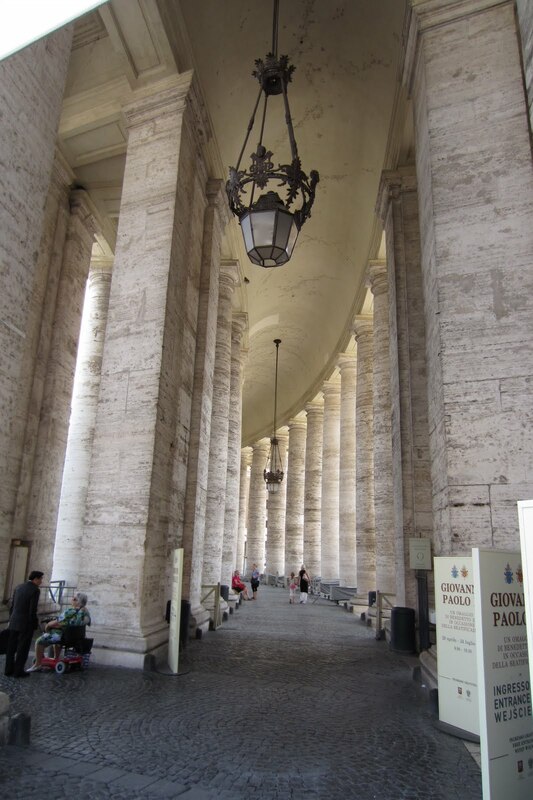 I love the columns in St. Peter's square. 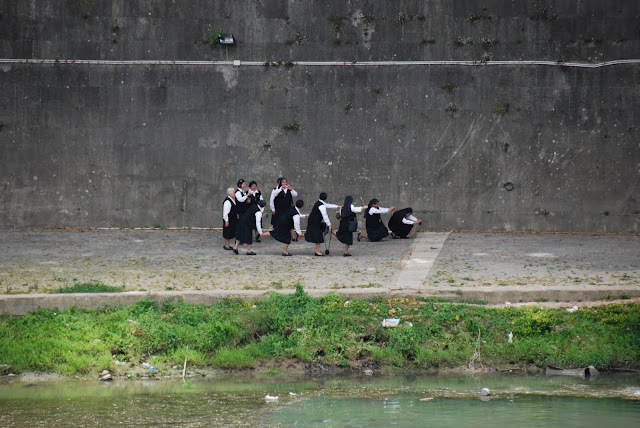 Nuns posing by the river! So cute! After meeting up with the girls and having a quick bite to eat, we went back to the hotel where we dropped M off (she had to work, if you can believe that! ), changed into shorts, and started our walking tour of Rome. Let me just say here that I am not normally a shorts person. I normally stick to pants and skirts, but had packed one pair of shorts "just in case." Italy in June was so hot and sticky that I wore those shorts nearly every day we were there - with a few exceptions with skirts so I could wash the shorts. 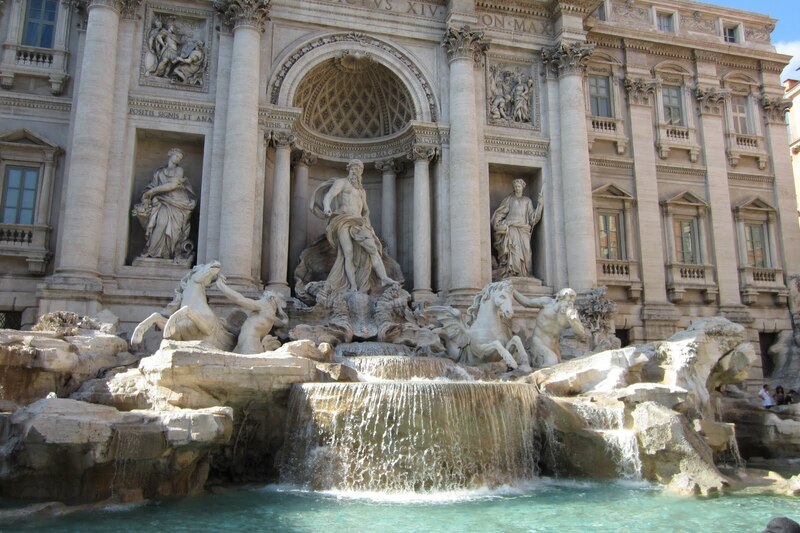 Travel tip: Bring lightweight clothes to Italy if you're going in June! You will regret it if all you have is jeans! 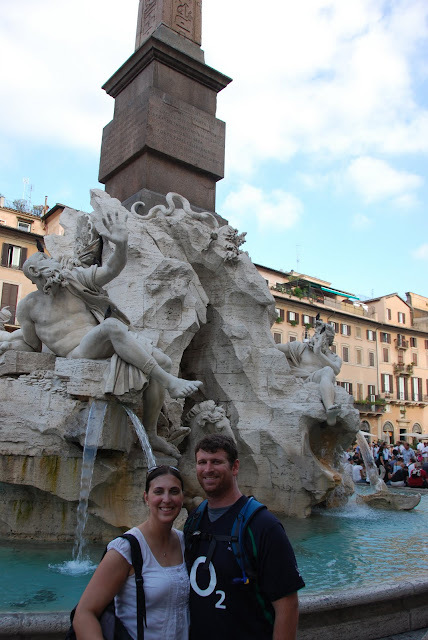 We started off at our hotel, which was pretty close to the Castel Sant'Angelo. We first walked to the Spanish Steps, then continued to Trevi Fountain, the Pantheon and Piazza Navona. 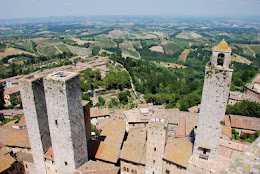 It was a good 2-3 hours of walking, once you included the stops for gelato, the stop at a DeSpar for cheap waters, and the stops in shops to get out of the heat for a moment. 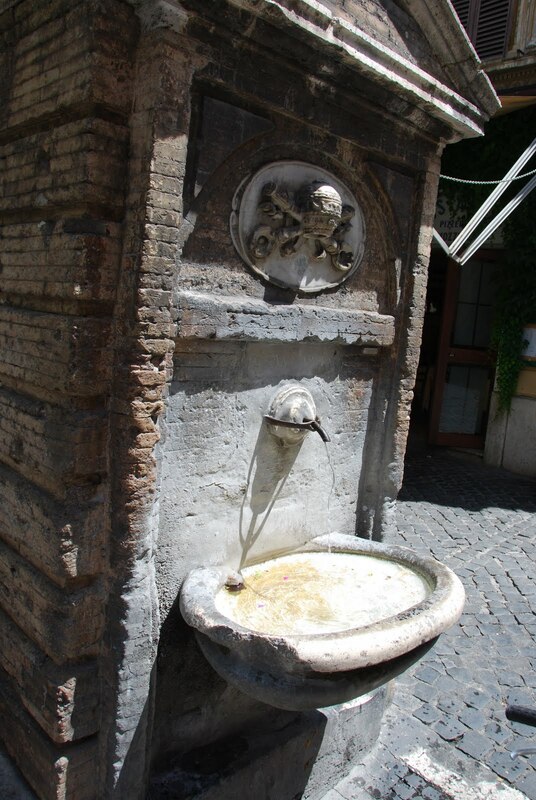 One of the many fountains in Rome - the water from these fountains is perfectly safe and quite delicious! Bring a bottle along with you and refill whenever you need to. 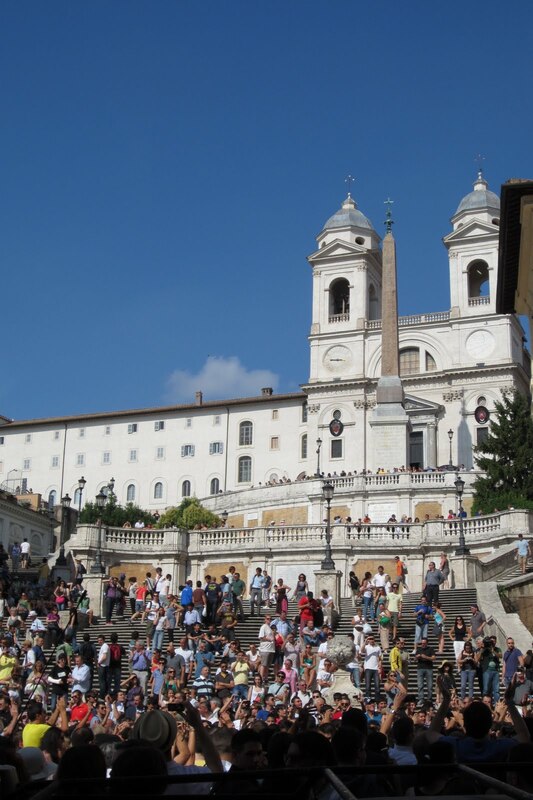 The Spanish Steps were remarkably busy due to a local radio station's event that was taking place. 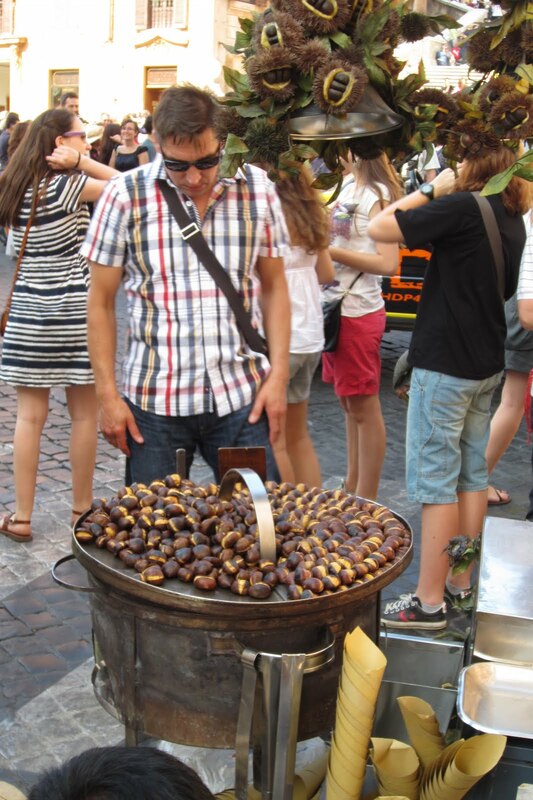 A street vendor selling roasted chestnuts - it was so hot we couldn't even imagine eating them! After our walking tour, we headed back to the hotel to collect M and change for SAY's birthday dinner. That's right, her wedding and her birthday were within days of each other! 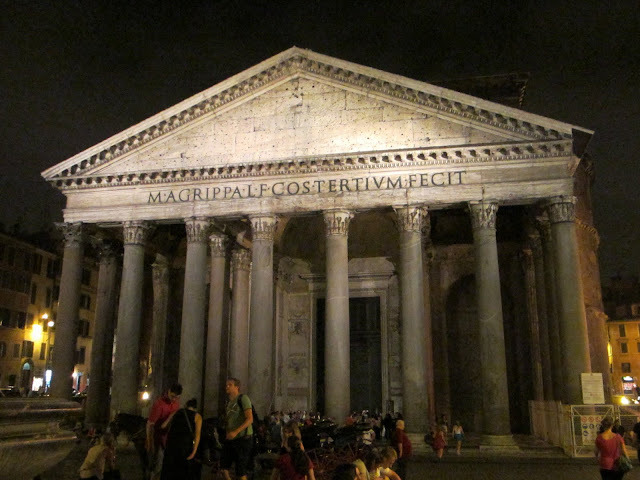 We met up with SAY, Dr G and their families by the Pantheon and enjoyed an incredibly delicious dinner. We had so many appetizers that we were already stuffed by the time our first courses came. No way could we have done the traditional second course as well! 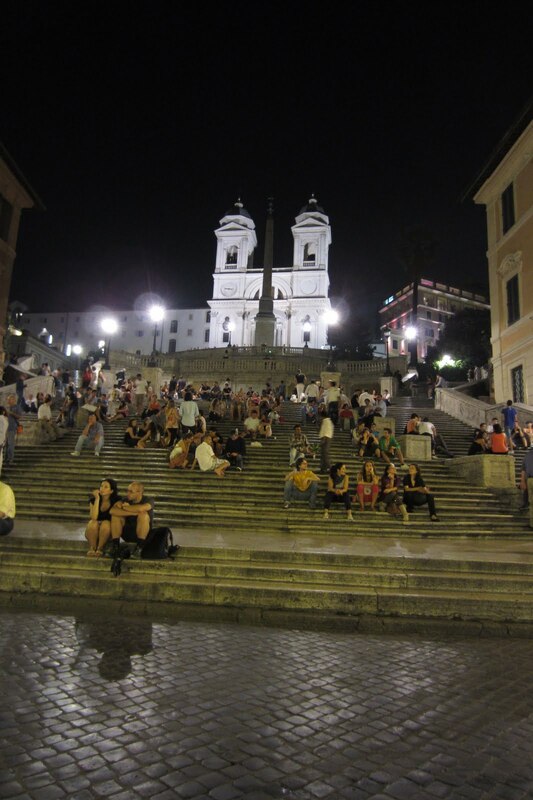 After dinner, we took another walking tour to see some of the sights by night. We thought they would be less crowded at 11pm, but Trevi Fountain was still packed. The cooler weather was amazing, though, as we wandered through the streets enjoying Rome by night. 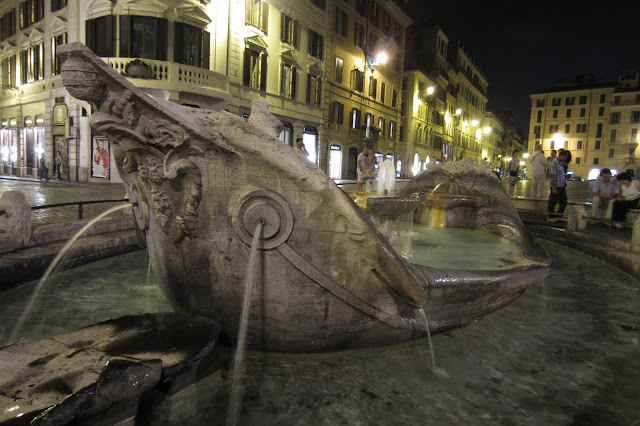 I would definitely recommend this - Rome by night is kind of magical. 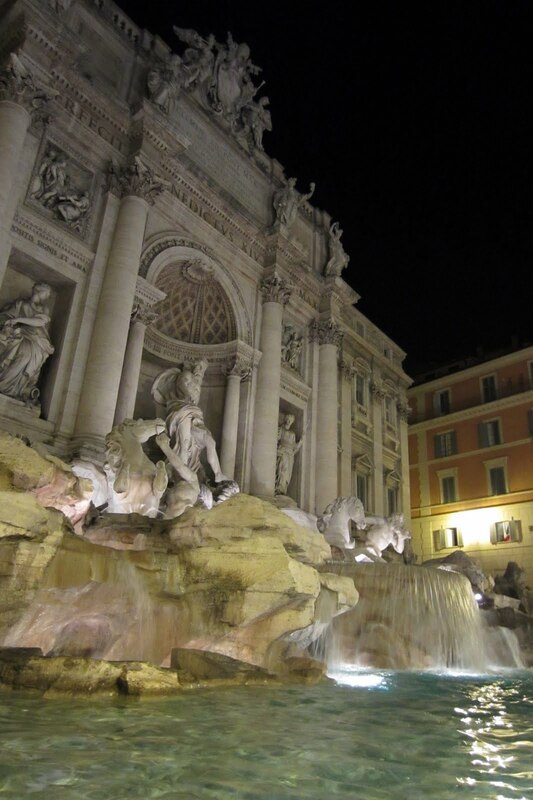 Trevi Fountain was cool and refreshing at night! The following morning we sucked it up and taxied over to the Colosseum. There are a ton of vendors providing tours outside of the Colosseum, which was convenient, since the tour I thought I'd booked for us to see the underground at the Colosseum fell through. 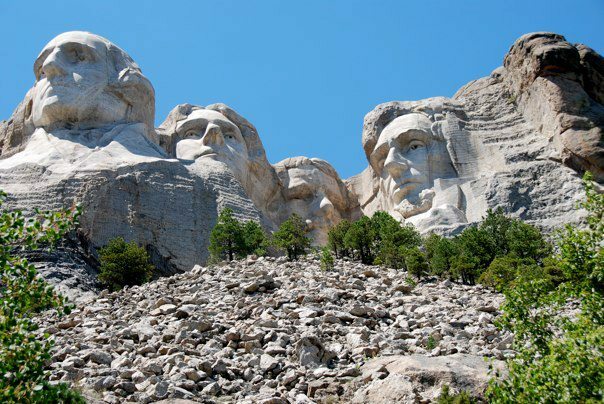 That was a huge bummer - I booked online and they charged my credit card, but then informed me there were no tours available since I hadn't booked far enough in advance. After a few frustrating emails after the trip, my money was refunded, but it was a bummer to miss out on seeing the underground. 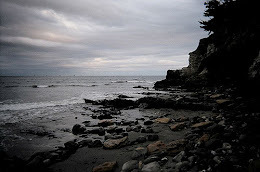 I'll be sure to book much farther in advance if we are there again. It ended up working out to book the tour at the Colosseum. We booked a tour which did the Colosseum as well as Palatine Hill (which BF and I had never seen) and the Roman Forum. Palatine Hill was our favorite part of the tour - a very cool site with SO much history, and great tour! After our tours were done, we made our way over to the train station for a train to Siena. There are two trains you can take - the regional train that's fairly cheap but takes a few hours, or the fast train that's half the time but twice the price. We went with the cheaper one on the way out, because we weren't in a hurry. We shared a six person cabin with one other traveler, and enjoyed the much needed air conditioning on the way to Siena. At the end of the trip, we spent an additional almost full day in Rome. We wanted to see more of the city, but were REALLY tired of walking by that point, so we did a loop on the "hop on, hop off" bus. We got the ticket where you couldn't hop on/off, but just stayed on for a loop of the city. 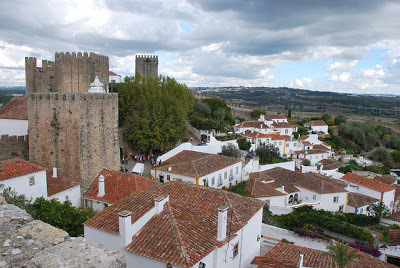 We saw everything we wanted to see from a very cool vantage point, and it was pretty worth it. A lot of Rome is very spread out, so it was nice to drive from place to place. Up next: Siena & Corsano!